A TV Review: JUSTIFIED “Fire in the Hole” (2010). JUSTIFIED “Fire in the Hole.” Season One, Episode One. FX, 16 March 2010. Timothy Olyphant, Walton Goggins, Joelle Carter, Nick Searcy, Erica Tazel, Natalie Zea. Based on a short story by Elmore Leonard (ebook, 2001). Series developer: Graham Yost. Director: Michael Dinner. This, the first episode, seems to follow the story closely, but in truth this is hearsay only. I have not read the story, one in which Deputy U.S. Marshal Raylan Givens (Olyphant) kills a Miami gangster before the latter could pull his own gun and fire, even though he made his move first. Even though the killing was “justified,” Givens is reassigned to the area of home state of Kentucky where he grew up, and his past quickly fills his life again. In particular, his partner in the coal mines, Boyd Crowder (Walton Goggins), when they were both 19-year-olds, is now a local criminal hiding behind a facade of Bible-thumping white supremacy. The two meet again after Crowder’s brother is killed by his wife (Joelle Carter) after years of abuse, and an almost deadly shootout ends this first installment of the six-season series. I do not know where the story goes from here, but there is plenty of potential, with Givens’ ex-wife part of it, I am sure, as well as the fellow officers in his new place of work. I am also sure that more characters will be introduced as time goes one, but it’s rather obvious that the relationship with Givens and Crowder will be the major one that will continue to develop and be explored. The cast and production values are all excellent. You spend money on a TV series, and it shows. I don’t know how involved I want to be in watching the rest of the story, but if I start, I am sure it will be addictive. A TV Series Review: THE THIRD MAN “One Kind Word” (1959). THE THIRD MAN “One Kind Word.” BBC, UK, 02 October 1959 (episode 1, season 1). Syndicated, US, 03 September 59 (?). Michael Rennie, (Harry Lime), Rupert Davies (Inspector Shillings). Guest cast: Mai Zetterling, George Pastell, Eric Pohlmann. Based on characters in the novel The Third Man by Graham Greene and on the 1949 film of the same title starring Orson Welles. Director: Cliff Owen. Before this TV series, there was also a spinoff on British radio called The Adventures of Harry Lime (broadcast in the US as The Lives of Harry Lime), also starring Orson Welles. Produced by Harry Alan Towers, it lasted for one season, 1951-52, and 52 episodes, most readily available to listen to today. Although well remembered by OTR fans, the television series lasted longer, from 1959 to 1965, for a total of 77 30 minute episodes. The radio series took place before the film, but the TV series covered Harry Lime’s post-war activities, after (if I understand it correctly) he had become a legitimate import-export dealer in both London and New York. Most of this first episode, however, consists of a flashback to a time in Vienna just after the war, when Harry was still deeply involved in the underground and a huge assortment of black market activities there in the British zone. Beginning in London several years after the war, this episode finds Harry being called to a hospital where a woman (Mai Zetterling) is near death after being rescued from the Thames River. It turns out that he had met her twice before, once during the war in Cairo, and the second time in Vienna immediately afterward, when she was involved in a smuggling operation she tried to lead Harry to and have him join up with them. She obviously did not lead a happy life, and as the title of the episode suggests, one kind word at the right time, ibe hat she never received, may have made all the difference. This is a very moody piece, with lots of dark shadows, tight closeups and mysterious men hidden in doorways, some with guns. Not to mention the trenchcoat Harry seems always to be wearing, and the inevitable zither music, always at the appropriate moment. Many of the 77 episodes are available on the collectors’ market, and if this one’s a good example, I’m going to see about obtaining them. Book Noted: CHUCK HARTER – Mr. Novak: An Acclaimed Television Series. CHUCK HARTER – Mr. Novak: An Acclaimed Television Series. Bearmanor Media, hardcover, softcover and eBook, illustrated, 15 October 2017. This book is a comprehensive look at a classic dramatic television series that aired for two seasons in the early 1960’s. It was filmed at the MGM studios, aired on the NBC network and showcased life at a typical American High School. The program starred James Franciscus as teacher John Novak with first Dean Jagger then later Burgess Meredith as the Principal of the school. Mr. Novak was the first series that portrayed teachers and students in a realistic dramatic manner. Previously there had only been sitcoms which didn’t reflect the lifestyles of the real students of America. The series featured top quality scripts, actors and production and won over 47 awards during its run including the prestigious Peabody Award for excellence. Many of the awards came from academic institutions which praised the show for its portrayal of the educational community. Such was the impact of the production that it prompted many to become teachers and many existing educators to improve their skills. The book traces the evolution of the series from development to the pilot’s production and acceptance by NBC. It then covers the filming and airing of the first season to great acclaim. The second season, which was fraught with controversy and discord is then examined with the result being cancellation. The legacy of the principals involved with the series is examined along with comments by those that continue to be interested in this vintage classic dramatic series of superior values. The book contains exclusive interviews with over 40 actors including Ed Asner, Frankie Avalon, Diane Baker, Beau Bridges, Johnny Crawford, Tony Dow, Sherry Jackson, Tommy Kirk, Walter Koenig, Martin Landau, June Lockhart, Beverly Washburn and many others. There are 243 illustrations and an index, including a complete episode guide with full credits, plot descriptions, vintage interviews, and new appraisals by the author. There is also an extensive appendix with a list of the awards Mr. Novak won, Producer E. Jack Neuman’s writer’s guide for Mr. Novak, An advice column for High School graduates by star James Franciscus, Principal Vane’s (Dean Jagger) speech to the new teachers, the Mr. Novak board game and more. Mr. Novak was a television series of exceptional quality and the amazing thing is that when episodes are viewed today — they are not dated or corny but are still relevant to modern times. ANNOUNCEMENT : Warner Home Video is going to release the first season of Mr. Novak (30 episodes) in a DVD set in 2018. They will be struck from the original 35mm camera negatives and should look pristine. A TV Review: MR. ROBOT “hellofriend.mov” (2015). MR. ROBOT. “hellofriend.mov” USA Network, 24 June 2015. (Episode 1, Number 1.) Rami Malek (Elliot Alderson), Carly Chaikin, Portia Doubleday, Martin Wallström, Christian Slater (Mr. Robot), Michel Gill, Ben Rappaport. Created and written by Sam Esmail. Director: Niels Arden Oplev. I’m always far behind the curve. This highly acclaimed cable network series has already been renewed for a third season, starting in October, and I’ve only just now sampled the beginning of the first, which has been out on DVD for a while. The leading character is a cybersecurity expert named Elliot Alderson, a nerdish young man who suffers from a severe society anxiety disorder, depression, and by night is an online vigilante, outing online predators, scam artists and worse. He is contacted by an underground group of hackers whose aim is to take down a gigantic worldwide corporation named E Corp (Evil Corp) which controls a high percentage of the world’s net worth. The leader of this self-named fsociety group is known only as Mr. Robot (Christian Slater), who in this first episode convinces Elliot in to take down the CEO of E Corp by a bit of totally illegal computer wizardry. There is no doubt that the series is well done, perfectly cast and beautifully photographed, and to me all of the code that shows up on Elliot’s computer screen looks authentic. (I’m no expert.) It is not surprised that the series as a whole currently has an 8.6 rating on IMDb. I have also watched the second episode, in which we learn more about Elliot’s friends, his not-so-friends, his psychiatrist, his drug-supplier (female, across the hall), but not yet all that much about Mr. Robot. There’s plenty of time for that, I realize, but this is as far as I’m going to go. I find all but one of the characters exceedingly unlikable — the exception being Elliot’s boss at Allsafe, and he probably is going to have problems that will be as depressing as all of the others. Even his psychiatrist has her problems, which Elliot in his usual awkward way, tries to set right. We may see the consequences of this in later episodes. As for Elliot himself, he has all kinds of conflicts to work out between himself, his friends — the few he has — and, well, the world in general. Elliot as a character is extremely well drawn, but I’m not ready to jump on board yet. For now, I’m going to pass on this one. I realize that I’m in a very small minority, but neither will I lie to you. A TV Series Review by Michael Shonk: COURT MARTIAL (1966). COURT MARTIAL. ABC; April 8 – September 2, 1966. Roncom Films,inc / ITC Presentation / MCA TV / Universal TV. Cast: Bradford Dillman as Captain David Young, Peter Graves as Major Frank Whittaker, Kenneth J. Warren as Sgt. John MacCaskey, and Angela Brown as Sgt. Yolanda Perkins or Diane Clare as Sgt. Wendy. Produced by Bill Hill or Robert Douglas. By the sixties. television drama was developing a social conscience. Lawyers were among the leaders of this type of drama with series such as THE DEFENDERS, BOLD ONES, and JUDD FOR THE DEFENSE often featuring cases that focused on the issues of the day. COURT MARTIAL followed that path and occasionally found great dramatic success. The series featured the activity of a small unit of the US Army’s Judge Advocate General’s Office (JAG). The star was Bradford Dillman as Captain David Young, a dedicated lawyer whose emotions and desire to find the truth often drove him beyond the call of duty. He was also a typical philandering bachelor of the era. Dillman at times overplayed the role as a womanizer, where in some serious scenes while he was questioning women Young was more interested in flirting than listening. Yet Captain Young was the conscience of the series. Co-starring was Peter Graves as Major Frank Whittaker, the officer in charge of the unit, and the one who chose the cases Young worked on. Graves was able to make Whittaker likable despite the Major’s loyalty to rules over compassion. He often argued with Young over methods but was flexible enough to let Young follow his passion. Whittaker at times took on a case himself even if it meant he was on the opposite side of Captain Young. The staff consisted of two Sergeants. One was staff aide Sgt John MacCaskey played by Kenneth J. Warren. His basic purpose was to either lighten up the episode or give another character someone to talk to. Finally there was the staff secretary. The series had two. First was Angela Browne as Sgt Yolanda Perkins. Next was Sgt. Wendy, played by Diane Clare. Both actresses were blonde and nearly interchangeable. Both were successful popular British actors. There was no explanation as to why the character Wendy suddenly replaced Yolanda. From the ten episodes I have seen the only difference between the two was Yolanda was more romantically interested in Captain Young than Wendy was. COURT MARTIAL began as a two-part episode on KRAFT SUSPENSE THEATRE. “The Case Against Paul Ryker” (October 10th and 17th, 1963) starred Lee Marvin, Dillman and Graves. 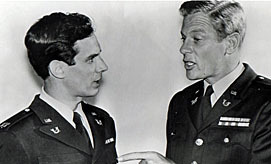 The two-part episode would later be re-edited into a movie called SERGEANT RYKER and released to theatres in 1968. The action took place in the Korean War. In 1966 British TV network/syndicator ITC with Roncom Production decided to do a weekly series based on the episode with both Dillman and Graves returning. Not surprisingly the action shifted to WWII, a war more familiar to the British viewers that watched the series on the ATV network. COURT MARTIAL became part of the late 60s British invasion to American network TV when ABC added THE AVENGERS and COURT MARTIAL to its line-up. ABC wanted to replace reruns with more original programs. COURT MARTIAL would take over for THE JIMMY DEAN SHOW. Other British series on American TV at the time were THE BARON on ABC and SECRET AGENT (DANGER MAN) on CBS. THE SAINT was scheduled to follow in the fall on NBC. (“Broadcasting” January 31, 1966). 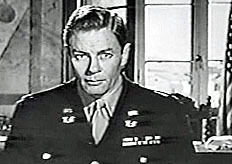 COURT MARTIAL focused on the tragedies of war, avoiding the pat expected happy endings common on much of American TV. Our heroes often lost their cases and the endings could make you wonder if justice had been served. It lasted only one season with 26 episodes filmed of which only 20 were shown in America (ten episodes are currently on YouTube). The series was more appreciated in England, airing all 26 episodes and winning the British Society of Film and Television (BAFTA) award for Best Dramatic Series. Production values were cheap. Location shooting was rare with much of the series shot at the Pinewood studio lot. There were too many British actors with bad American accents. Yet the realistic drama and depth of the characters and story more than made up for COURT MARTIAL flaws. “Judge Him Gently.” June 3, 1966. Written by Gerry Day. Directed by Harvey Hart. Produced by Bill Hill. Supporting Cast: Diane Clare as Sgt. Wendy. Guest Cast: Joan Hackett, Fred Sadoff and Henry Gilbert. *** A badly wounded soldier who faced a life of constant pain and suffering dies after receiving an overdose of morphine. Captain Young is assigned to prosecute a hospital corpsman that had been drunk at the time. After Young wins his case against the corpsman the Nurse in charge confesses she administered the fatal dose when the patient begged her to end his life. No one but Young wants to defend her and the act of euthanasia. One of the best episodes of the series. Brilliantly written by Gerry Day, perhaps the best TV script she ever wrote in her successful fifty-year career. She was able to show the effects of war from the perspective of a female nurse. Joan Hackett was outstanding playing the tense emotionally broken nurse, adding an intensity and tragedy to the all ready powerful story. The episode rejected melodrama for realism. It took on the issue of euthanasia as well as the cruelness of war with sensitivity and compassion. It rejected emotional scenes for scenes that showed the motives of all and the pain each dealt with inside. And most important it rejected judgmental easy answers. “Taps for the Sergeant.” April 15, 1966. Written by Daniel Mainwaring. Directed by Peter Maxwell. Produced by Bill Hill – Supporting Cast: Diane Clare as Sgt Wendy. Guest Cast: Lee Montague, Moira Redmond, and George Roubicek. *** France, August 1944. Major Whittaker takes on the defense of a Sergeant who had fought with the French Foreign Legion and the French Underground before he joined the American Army. The Sergeant had disobeyed an order, an order that cost 12 men their lives. The story of the Sergeant was dramatic enough but it also presented an effective look at the depth of Major Frank Whittaker. The ending is a good example of the series attempt at showing the darkness of war and the uncompromising world of the military. “Without a Spear or Sword.” June 24, 1966. Written by Mark Rogers. Directed by Peter Maxwell. Produced by Bill Hill. Supporting Cast: Angela Brown as Sgt Yolanda Perkins. Guest Cast: Dennis Hopper. Susan Hampshire and Francis De Wolff. *** Hopper plays a lonely loser, Cpl. Winston that gets caught with a stolen art piece. The piece was part of a private collection that was robbed before it scheduled move to a museum. The episode explored the emotional side of Young from his seducing the beautiful woman who worked at the museum to his caring concern for the Corporal. Where Major Whittaker was more disciplined, Young found it difficult not to get personally involved. COURT MARTIAL was a humorless, depressing quality drama that had little chance in its time slot of Friday at 10pm and opposite then hit series NBC’s MAN FROM U.N.C.L.E. This mix of COMBAT! and THE DEFENDERS deserves to be better remembered but instead joins the too many other forgotten attempts at quality dramas of the era such as SLATTERY’S PEOPLE and THE NURSES. TV Review: BRENNER “False Witness” (1959). BRENNER. “False Witness.” CBS; 6 June 1959. (Season 1, Episode 1.) Edward Binns, James Broderick. Guest Cast: Frank Overton, Kay Medford, Alan Ansara, Michael Conrad, with Dana Elcar (uncredited). Written by Loring Mandel. Director: Gerald Mayer. The series as a whole was reviewed here on this blog by Ted Fitzgerald almost seven years ago soon after a box set of DVDs was released. Now that I’ve watched the first episode, I’m impressed enough to want to see more. Ted described it as “character-driven drama about two New York City cops, Roy Brenner (Edward Binns) a veteran member of The Confidential Squad (aka Internal Affairs), and his son Ernie (James Broderick), a rookie detective,” details that for one reason or another weren’t completely nailed down in this first episode. This one’s about a hack assistant D.A. who wants Ernie to embellish, shall we say, his testimony against a man accused of splashing a container of lye in his wife’s eyes. No one saw the crime itself. The man says the lye was hers (in more ways than one) and she spilled it on herself. The D.A. guy puts all kinds of pressure on Ernie, but in the end he (spoiler) does the right thing. According to Wikipedia, the series was “filmed live,” by people who knew something about telecasting live TV. This particular episode begins with some interesting long tracking shots, and facial closeups are used to very good advantage. Skilled people were at work here. As for the guest cast, Kay Medford has the acting ability to make her quirky character, the victim of the attack, even more interesting than the lines she has to say, and Alan Ansara, as the cellmate of the accused assailant, sounds very much like Robin Williams to me in his exaggerated way of trying to say whatever he thinks he needs to that will earn him rewards from the police and D.A.’s office. What I found unusual, and the problem I alluded to above, is that there was no effort to “introduce” the characters. We do not even know who the younger Brenner is until he’s spoken to by name about ten minutes into the program. The father, Edward Binns, does not appear until there’s only two minutes to go. As he is sitting there in the courtroom awaiting the trial to begin as someone we have net seen before, the young Brenner sits next to him and calls him Dad. Presumably he has bigger roles in future episodes. TV Review: THE REPORTER “Extension Seven” (1964). THE REPORTER: “Extension Seven.” CBS, 60m, 25 September 1964 (Season 1, Episode 1). Cast: Harry Guardino (Danny Taylor), Gary Merrill (Lou Sheldon). Guest Cast: Rip Torn, Shirley Knight. Series created by Jerome Weidman. Writer-director: Tom Gries. This was from all reports, a highly ambitious TV series, but it evidently didn’t catch on withe viewing public, since it ended in December the same year, with only 13 episodes aired. This is the only episode I’ve been able to see. Others don’t seem to be around, or else I haven’t been looking hard enough. But based on this sample of size one, it was obvious that a lot of effort and talent was put into it. Harry Guardino plays a columnist/reporter for the New York Globe, while Gary Merrill is his city editor. I was reminded of an old-time radio show starring Frank Lovejoy called Night Beat, in which he comes across all kind of crooks and other people with problems, all grist for his column for a Chicago newspaper, but the basic idea I’m sure has been around for a long time. According to Wikipedia, all kinds of big names (or soon-to-be big names) showed up in the 13 episodes: Nick Adams, Eddie Albert, Edward Asner, Dyan Cannon, Richard Conte, Herb Edelman, James Farentino, Anne Francis, Frank Gifford, Arthur Hill, Shirley Knight, Jack Lord, Archie Moore, Simon Oakland, Warren Oates, Claude Rains, Paul Richards, Robert Ryan, Pippa Scott, William Shatner, Barry Sullivan, Roy Thinnes, Daniel J. Travanti, Franchot Tone, Rip Torn, Jessica Walter, and Efrem Zimbalist, Jr. In this the first episode, Rip Torn plays a nobody of a man who is encouraged by one of Danny Taylor’s columns to not not stand idly by when he sees a woman being seriously harassed by a gang of juvenile delinquents. For this he gets a knife in the stomach, and he blames Danny Taylor, whom he calls to vent his frustration and feelings. Problem is, he will die if he doesn’t get medical attention, but he doesn’t know where he has found refuge, only the extension number on the phone. The hoods are also looking for him so they can finish off the job, which provides exactly the kind of suspense that makes a 60 minute program, including commercials, pass very quickly. On the other end of the line, while Danny is trying to have the call traced, is Shirley Knight, a copy girl for the paper and another lost soul, and a second kind of connection is made. The script does get kind of preachy at times, especially when Merrill reminds Guardino that his job is not to feel guilty for getting the victim to risk his life on the basis of his newspaper column — Guardino seems to have been around long enough to not need a rookie reporter’s pep talk — but all in all, this was a top notch production that did what it was supposed too, keep the viewer’s eyes on the screen at all times. A Future Forgotten TV Series, by Michael Shonk: THE PLAYER (2015). THE PLAYER. NBC, 2015; Thursdays, 10pm-11pm. Kung Fu Monkey Productions and David Entertainment in association with Sony Pictures Television. Cast: Philip Winchester, Wesley Snipes, Charity Wakefield, Damon Gupton. Created by John Rogers and John Fox. Executive Producers: John Rogers, John Zinman, Patrick Massett, John Davis, and John Fox. It is the new fall TV season, and time for new series to be judged. Some new series will join our list of series we watch every week, more new series will be rejected and forgotten. While not the worse of the new series this season (Fox’s Minority Report is the worse) The Player shows all the signs of a doomed series. Rejected by critics and viewers alike, a strange premise ineptly handled, The Player is one to watch soon before it is gone forever. The premise of The Player is that there is a secret society of the world’s very rich and powerful that has set up a system where they bet on crime. Created in America around the turn of the 20th Century, the game grew popular with the ruthless rich and powerful of the era. Ada Lovelace and Charles Babbage created the first computer to help with the game and Thomas Edison got it to work. The game went global and quickly was out of control and started WWI. To regain control of the game the House was created. The House is run by the Pitboss who sets up the game, the Dealer who monitors the game and offers assistance to the final employee of the House –The Player. But this is NBC, a major free network, so it should come as no surprise that a premise open to thought-provoking discussions on the immorality of the bored rich gambling on the outcome of crimes would instead be a mindless fast pace violent implausible immortal action TV series with the inability to avoid any TV cliché ever written. The Player is Alex Kane, a former special op with a dark past, now living in Las Vegas as the World’s Greatest Security consultant. Philip Winchester (Strike Back) does what he can with his limited range to play this standard issue TV action hero. In the type of creative thinking typical for this series Alex’s best friend is Police Detective Cal Brown (Damon Gupton) who worries about his friend and is always the cop in charge when Alex destroys part of the city fighting bad guys. Alex’s love of his life is his ex-wife Virginia Lee (Daisy Betts). They love each other very much and have finally decided to get back together. That night while our hero and ex celebrate in bed bad guys attack and she is killed. But this is modern comic book inspired fiction, so is she really dead? Meanwhile at the House is the Pitboss Mr. Johnson played by Wesley Snipes (Blade) in not his best performance. Mr. Johnson is an evil soulless man who believes in blackmail, murder, whatever it takes to serve the House. He also believes in tough love when dealing with The Player. The Dealer is the blonde beauty Cassandra King. Charity Wakefield (Mockingbird Lane) has shown she is capable of portraying the series most conflicted character. She is aware of the immorality of the game but in some of TV’s lamest dumb-down dialog tries to convince Alex that they are doing good, saving the victims of crimes enjoyed by the evil rich gamblers. The series features more property destruction than a Marvel’s superhero movie, more pointless car chases and stunts than a Bond movie and a believability level that wouldn’t convince a 12 year old. The suspense is weaken by the number of deus ex machina devices used – from an all knowing computer named ADA that Cassandra can use to get Alex out of any jam to Johnson’s ability to call in a get out jail card whenever the cops get too close. You can view the pilot episode for free at iTunes. This is just one of many TV series that first episode can be downloaded for free at iTunes. The odds are against The Player. While handicapped by a bad time slot it has a strong lead-in (Blacklist). How much of the Blacklist audience it loses will tip you off on its future. Personally, I would bet The Player doesn’t survive to see January.